Greenwealth Community Initiative was registered under the laws of the Federal Republic of Nigeria in 2010. Greenwealth Community Initiative aims to establish helpful strategic Interventions that seek to combat the negative effects of the above mentioned vices and scourges affecting the Nigerian Youth today among others. This is done through peer education and sensitization, advocacy and enlightenment programmes, production and distribution of sensitization materials including introduction to skills acquisition and empowerment. Greenwealth Community Initiative is a young people focused organization targeted at transforming the lives of youthsin Nigerian communities. Our vision is to contribute to the reduction of drug abuse and related crimes among the youth through advocacy programmes thereby making the youths to realize their dreams and contribute to national development. To promote prevention of drug abuse among the youth in our communities. To create deliberate awareness of the dangers of drug abuse, human trafficking and related crimes and their effects on the lives of the youth. To promote behavior change and reduce cases of crime associated with illicit drug abuse. 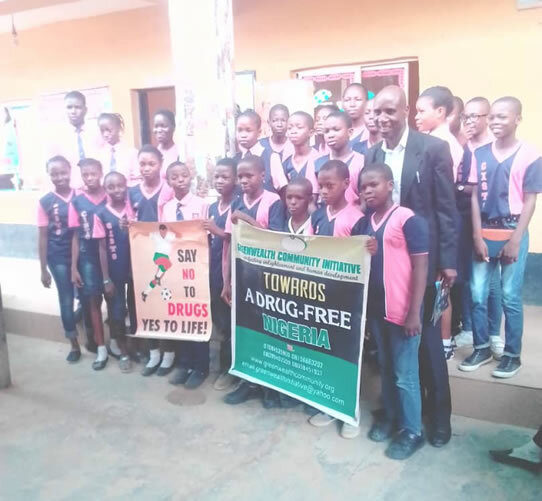 Organizing and conducting peer education activities thereby providing useful information on how to stay out of illicit drugs and associated crimes. Visiting communities and interact with young vulnerable groups. Organizing vocational training and employment seminars. Education and advocacy for youths at risk. Youth leadership training aimed at building leadership and good governance among the youths in partnership with government agencies, NGOS, interested private individuals and corporate organizations to ameliorate the plight of the vulnerable groups. •	To promote prevention of substance abuse among the youth in our society. •	To create deliberate awareness of substance abuse and its destructive effect among the youth. •	To promote attitudinal change among the youth in collaboration with corporate bodies, private individuals and religious institutions. •	To set in motion an effective mechanism for rehabilitation of those caught by the web of drug abuse. Our current activities are mainly the enlightenment of the youth on the dangers of drug abuse, human trafficking and related crimes.